Instead of wearing modern Kevlar-blend motor breeches, he steps into triple-thick wool duty pants — which are hotter and don’t breathe nearly as well as the modern synthetic material. 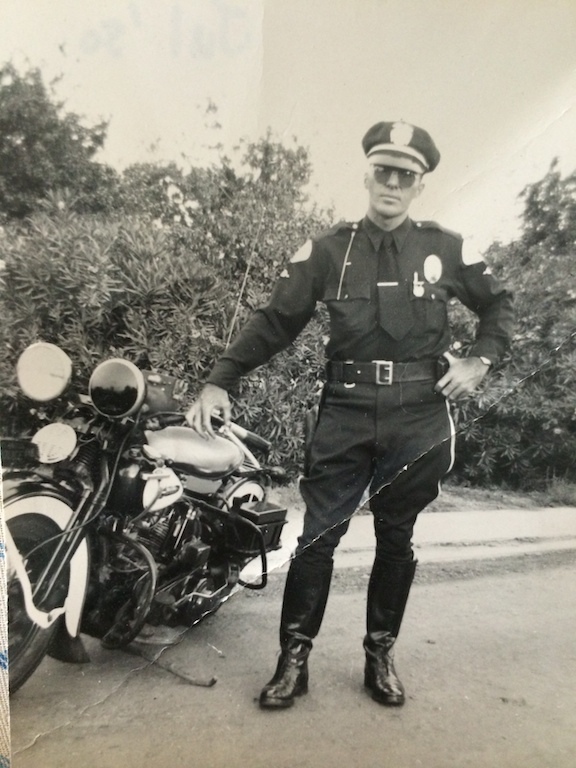 In the grainy picture from the early 1950s, a handsome, square-jawed cop wearing shades is standing next to his 1949 Harley-Davidson police motorcycle. Baas’ eyes well up when he talks about the man by the bike. 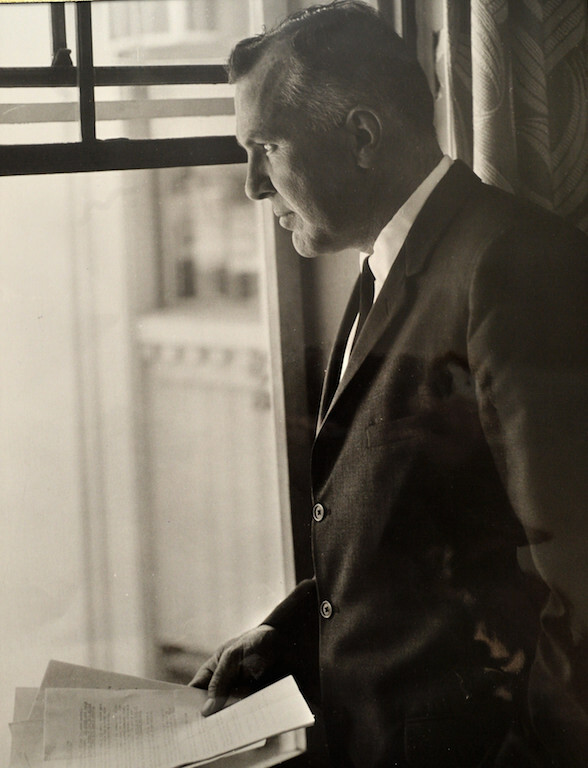 He’s John A. McAllister, who ascended the ranks of the Los Angeles Police Department with his friend and colleague Daryl Gates, the late legendary LAPD chief of police. 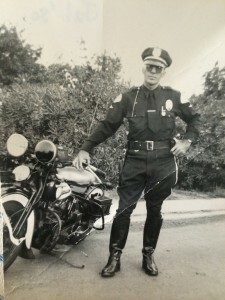 McAllister was deputy chief and former chief of staff when he retired from the LAPD in June 1979 after a stellar 30-year run. 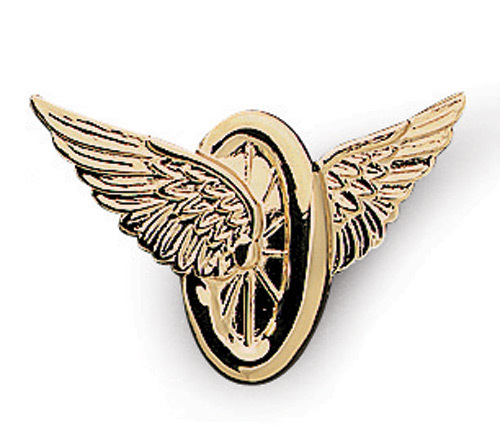 A former motor officer who maintained a passion for Motors throughout his career, McAllister also is Baas’ grandfather – a man of great distinction and integrity who was a close father figure to Baas. Baas bounces his son, John, on his knee. “When my grandfather passed away on Jan. 1, 2004, when I was 15 — that’s when I really decided I wanted to follow in his footsteps,” says Baas, who apologizes for getting emotional. 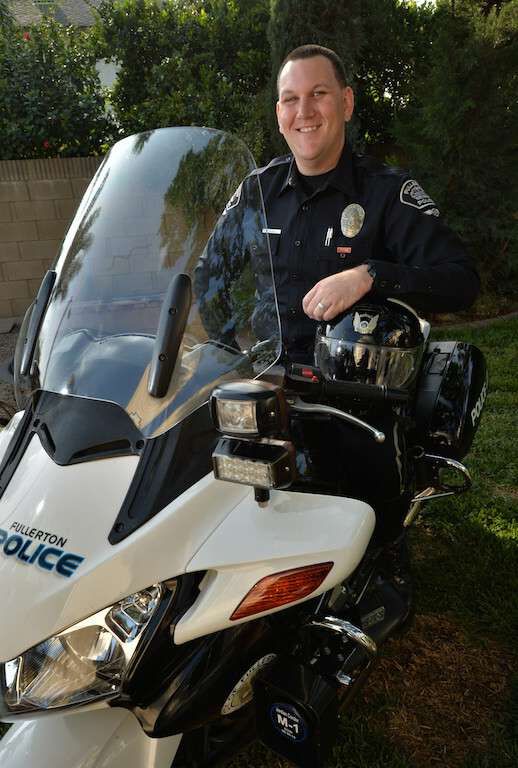 Fullerton PD Motor Officer Kyle Baas says law enforcement runs in the family. His great uncle, grandfather and aunt were also were motorcycle cops. The 6-foot-4, 285-pound Baas may be a giant of a man, but a big part of him still is a boy in awe of his grandfather. John Alexander McAllister was born Sept. 12, 1923 in San Francisco to Lieutenant Commander Harvey Ross, MD, and Edith McAllister. John grew up with a brother, Harvey Ross McAllister Jr. — who also would make a big name for himself at the LAPD — in Taft, a small town in the foothills of the San Joaquin Valley. After serving as a P-51 fighter pilot in the U.S. Army Air Corp and fighting in the Pacific Theater, John McAllister returned home, finished college and decided he wanted to be a cop. 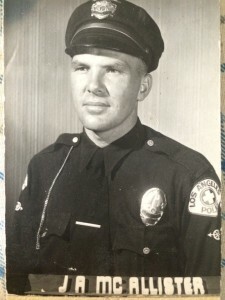 Baas, who can instantly recall key dates and facts about his grandfather’s life and career at the LAPD, says Gates never forgave McAllister when McAllister graduated at the top of his police academy class in December 1949 — one slot ahead of Gates, chief of police of the LAPD from 1978 to 1992. Gates was a close friend of the McAllisters and Baas, who grew up in Chino Hills, recalls getting to know Gates at family functions. And he fondly recalls boating with his grandfather during visits to McAllister’s cabin at Green Valley Lake, near Big Bear Lake in the San Bernardino Mountains. 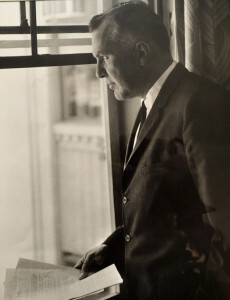 Baas inherited several of his grandfather’s police memorabilia when McAllister died in 2004 at age 80 of amyotrophic lateral sclerosis (ALS), or Lou Gehrig’s Disease. Baas’ other role model at the LAPD — Harvey Ross McAllister Jr., John McAllister’s brother — was a close friend of Officer Ian J. Campbell, the 31-year-old victim of the notorious Onion Field execution-style killing on March 9, 1963. Harvey McAllister was the lone bagpipe player at Campbell’s funeral — the first time the LAPD had bagpipes played at a funeral for an officer. Since then, bagpipes have been played at the funeral of every LAPD officer killed in the line of duty — and McAllister’s bagpipes are on display at the Los Angeles Police Museum. 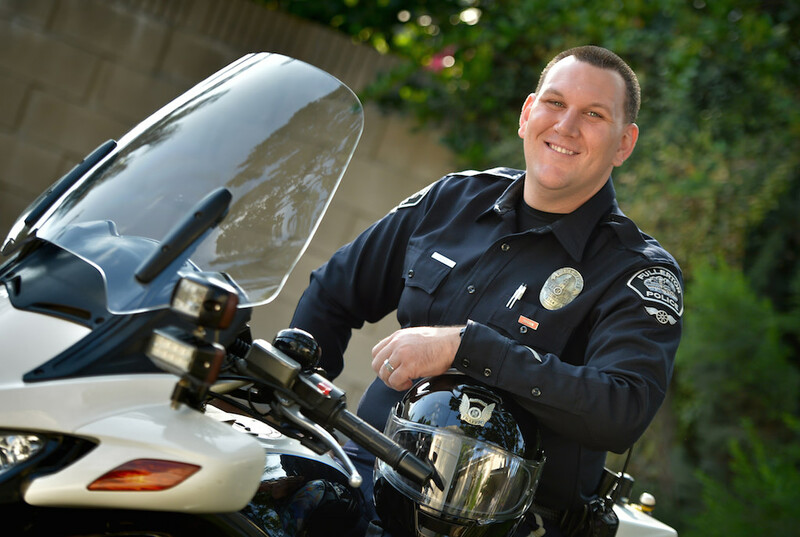 Baas has a third relative on his mother’s side in law enforcement who helped inspire him to become a cop: his aunt Julie McAllister, a retired detective sergeant with the LAPD. 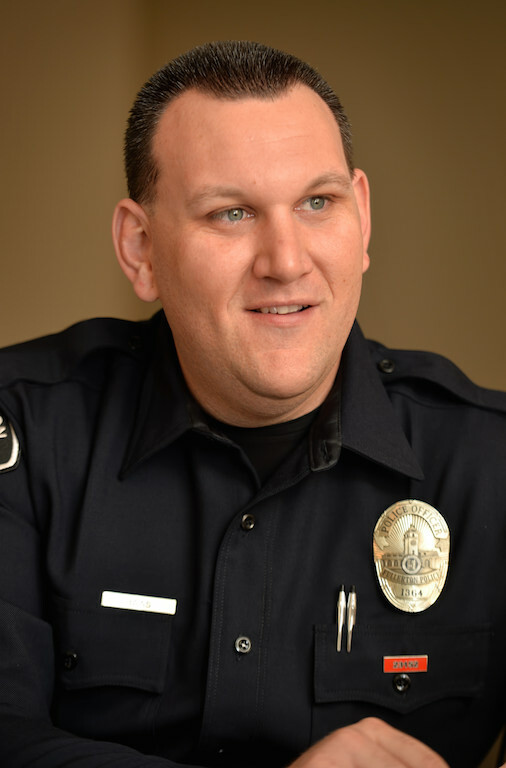 After working at a pizza joint and grocery story after high school, Baas took the advice of officers he had met through his relatives and became a cadet at the Fullerton PD, in 2007. Baas recalls meeting the chief of police at the time, Pat McKinley. “You’re John’s grandson?” McKinley asked Baas. Turns out McAllister was McKinley’s supervisor when the former Fullerton PD chief was an LAPD officer. “He’s one of the best chiefs I’ve ever seen,” McKinley told Baas. Baas went on to graduate from the Fullerton College Police Academy in May 2009. Because there were no immediate positions available at the FPD, Baas worked for 2 ½ years as a police officer for Sierra Madre before the FPD made good on its promise to hire him. He joined the FPD in October 2011. Baas first worked patrol and started training for his dream job — motor officer — in June 2014. He went to motor school in July 2014 and after graduating started patrolling Fullerton on his Honda ST1300 — a motorcycle equipped with a windshield and much, much more. A couple of years ago, Baas started playing bagpipes in honor of his great uncle and now plays them at official Fullerton PD functions. 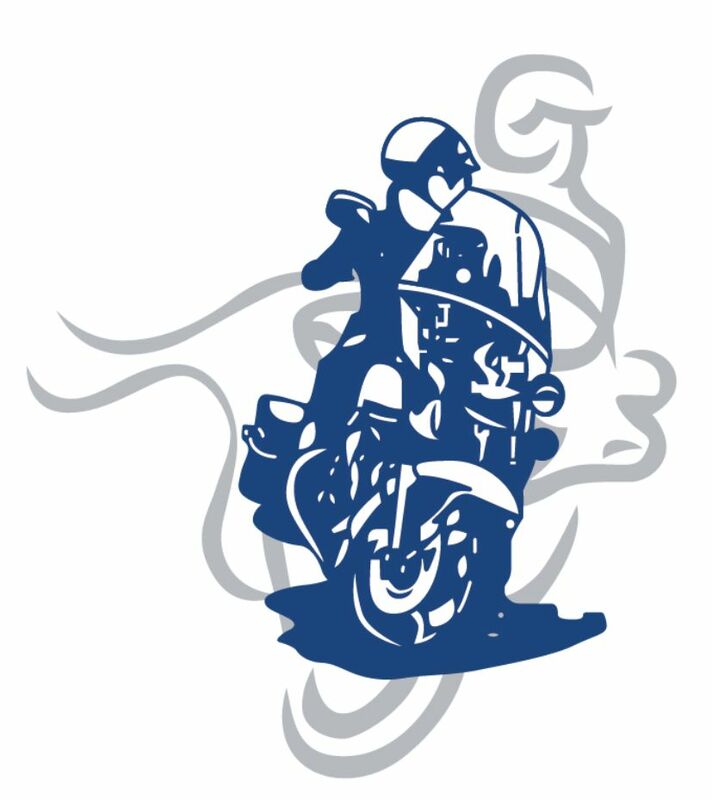 Baas hopes to be a motor officer for several years. 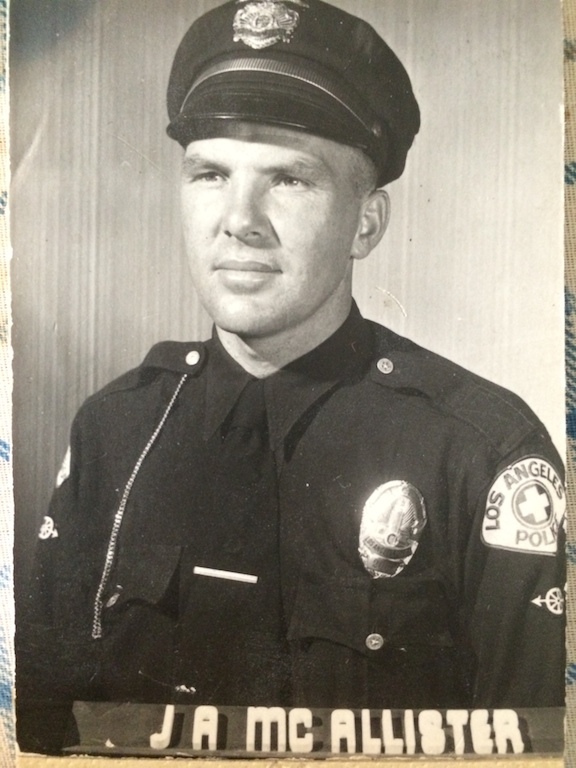 An early shot of John McAllister, an LAPD cop from 1949-1979. He died in 2004. He looks lovingly at his son. “I would love for him to follow in my footsteps,” says Baas, who named his son after his grandfather. He adds: “For him to carry on our family history of nearly 70 years in law enforcement would be very special. “I will make sure he always knows what a great leader my grandfather was — and still is to our family today. “I will teach him the importance of integrity, honesty and pride — just like I learned from my grandfather. Baas named his 3-month-old son after his grandfather and says he hopes his son, John, follows in his footsteps and becomes a cop, too.